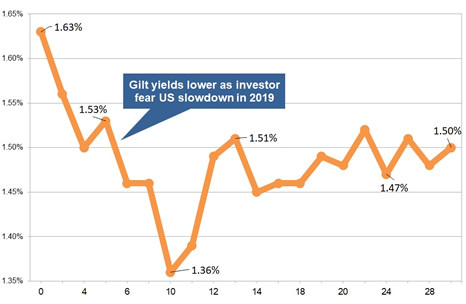 Gilt yields are lower for the month as investors retreat from equity markets following geopolitical tension between the US and China. Continued geopolitical tension between the US and China with a fears of a slowdown in the US economy has seen investors leave equities and back to the safety of bonds and gilts forcing yields lower. 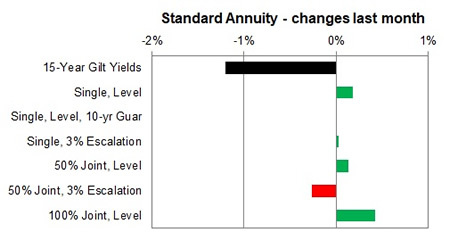 The 15-year gilt yield decreased by 13 basis points to 1.50% during December 2018 with providers of standard annuities increasing rates by an average 0.10% for this month and we would expect rates to decrease by -1.40% in the short term if yields do not fall. 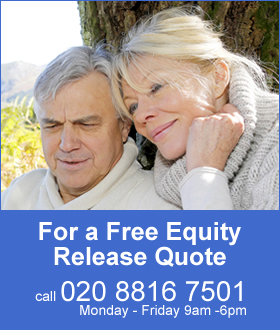 For smoker and enhanced annuity providers have increased their rates by an average of 0.18% and rates may fall by -1.48% in the short term if yields do not fall. 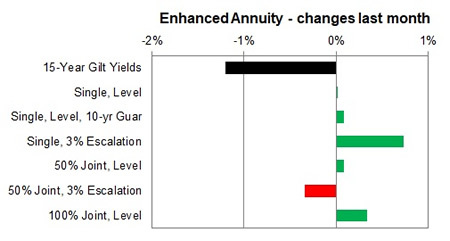 For the month 50% of annuity rates increased by up to 1.2% with 23% remaining unchanged and 27% decreasing by up to -2.7%.